A short while back the Space Shuttles were being moved around the country to their final resting places after being retired by NASA. I had hoped to see The Endeavor during its flyover. It was scheduled to go right past my office building and, had the weather been clear, I would have had a perfect few of it from my office window. The weather looked like it was going to be beautiful so I waited. And I waited. And I waited. A low hanging fog bank moved into the Monterey Bay between my vantage point and the flight path of the plane carrying Endeavor. I missed it. Yesterday I took my chance to correct that loss. I visited the National Air and Space Museum. 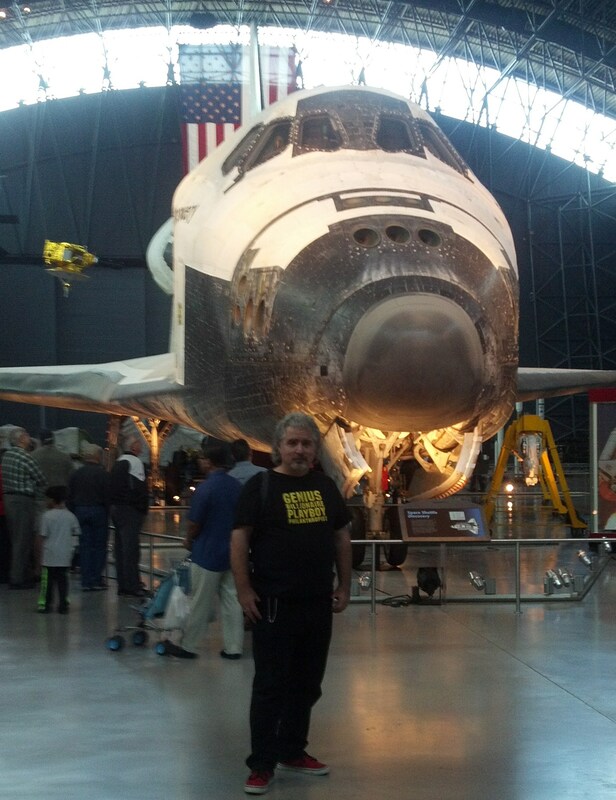 And I got to spend time with Discovery. I know the arguments about whether or not the shuttle program was a success or a failure. Nevertheless they still represent something very important to me. I saw mission after mission succeed. I saw the tragedy of lives lost. I saw the results of science experiments done in space that have gone on to improve our lives. New technologies and new industries sprang up because of the Shuttle Program. Many years ago, when I was a kid first experiencing a world with space shuttles I visited the Lawrence Livermore Laboratory on one of their infrequent “open house” days. As I recall they only have them once every five years. Among the many things I saw on display was a shuttle tile heated up to re-entry temperatures. No shuttle had flown in space yet. This was back when the only shuttle that existed at all was Enterprise and she would never fly in space as she was only a prototype test vehicle. So much rode on the ability of these tiles to withstand re-entry. I was told how each and every tile was unique because of its size, shape and placement on the skin of the shuttle. And I looked at this glowing piece of material and was hypnotized by it. We look at cgi-animations of re-entry vehicles and there is always the glowing cherry red and fiery orange look to them. But no matter how impressive the animation is I can tell you that the reality is far greater. Yesterday I sat and I looked at the tiles on the side and underneath of Discovery. They made a definite decision to not clean her up. She bore the scars of her final flight, burn marks, dirt and char. She looked weathered, worn, old. She was still one of the most beautiful things I’ve ever seen in my life. An era of space travel has ended for us. Another one is opening thanks to the Space X programs. It looks like we stand on the edge of a new and exciting time in space exploration if we are brave enough, clever enough and idealistic enough to grab it and, like Felix Baumgartner just did, leap into the unknown. Spidora! Half Woman! Half Spider! All Creepy! Given as we are fast approaching Halloween, my absolutely favorite holiday of the year, I thought it might be fun to post a few things of I always loved from Carnival Haunted Houses in particular. I’m not sure how many of these I’ll be able to bring to you before Halloween is upon us but I promise you’ll get some fun stuff no matter what. Spidora is a giant spider with the head of a woman. She talks, she answers your questions and generally speaking she’s absolutely fascinating and terrifying to a six or eight year old kid like me who hates spiders but also has to just know what the heck is going on. Sadly, however, I have to say that when I first saw her it wasn’t under the ideal sideshow conditions. She wasn’t presented to me as a real creature but simply as a carnival illusion and photo opportunity much like the things you’ll find in amusement parks now where you can crawl inside or stick your head through and have your picture taken. That’s right, I got to be inside the contraption and become a giant spider. Which may or may not have scared me for life, I’m not sure. Still, even after having climbed into the thing I wasn’t sure how it worked to make it look like my head was on the body of this giant spider. I poked around it after I got out and tried to figure it out. Unfortunately the clip below doesn’t really show you how good an illusion it really is. Trust me when I say that you can walk right up next to this thing look underneath the spider body and not see how a persons head is coming out of it. Not unless you really know absolutely what you are looking for. But these days I really wish I had been presented the opportunity to see Spidora as she was meant to be seen, inside a Ten-In-One (a sideshow tent housing ten attractions under one roof) or as one of the oddities as presented in the clip below. I have plans now. No, I mean, blueprints. Actual plans for how to build this wonderful sideshow attraction. Someday I hope that I can. A number of years back I discovered that in my family history I have a spiritualist minister. My great grandfather on my father’s side was an ordained minister and used to engage, apparently, in talking to spirits. Since then I’ve tried to get my hands on his ordination papers, but no luck at this point. I have been interested in charlatanism for a very long time. In fact, back in High School I actually took the opportunity provided by my photography class and my sci-fi lit class to provide a sort of hoax that I showed to everyone just for the fun of it. The hoax was a photograph of a ghost. A little spirit photography. The picture is long since gone but I remember it very well. The camera I had back then was an old SLR and I was using a lot of black and white film back then because it was cheaper and what the class generally supplied. Using a tripod and really long exposure time I simply set the camera up, opened the shutter, walked into the field of view, stood there for a few seconds and then walked out again. Total exposure time about 20 seconds. As the Teacher’s Assistant for the photography class it was my job every morning to set up the darkroom including mixing all chemistry for that day and putting out the supplies. But once that was done I had my own little empire and I could do anything I wanted. I developed the film, made some prints and “BOOM!” Spooky evidence of a ghost in my backyard. I showed the picture to my teachers and to other students to a wide variety of reactions. I never said it was real but I didn’t deny it for a long time either. You see my sci-fi lit teacher Mr. Gutierrez was kind of in on it. I did the whole thing on my own but he saw the value of it as a way to make his students think a little harder about irrational things. Eventually we revealed the hoax. The people who were skeptics all along were not surprised. The students who also had photography classes and experience were not particularly surprised. The people who knew me well enough to know that I was probably up to something were not surprised either. The believers were in total denial. Surprise. Obviously the experience stuck with me and one of the things that I have always found the most interesting from the realm of spiritualism is ghost photography. 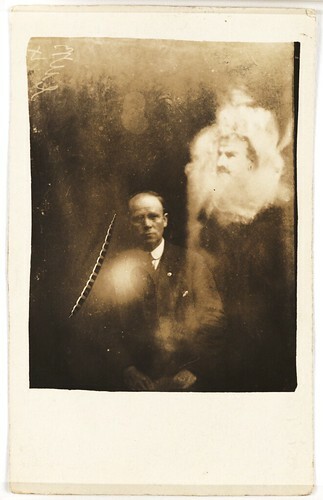 In the early 1900’s a guy named William Hope was one of the best known spirit photographers around. He made tons of money scamming people by taking spirit photos of their dead relatives and loved ones. He had a rather large following including Sir Arthur Conan Doyle who was an ardent follower of all things spiritualist and was responsible for the fame of the Cottingley fairies. It was definitely a time when some amazing things seemed to be caught on film. Of course today we are jaded by Photoshop and movie special effects. But it’s not that hard to imagine the impact seeing spirit photos must have had. Well, recently a new collection of spirit photos taken by William Hope has been uncovered. Take a look and imagine what it might have been like to sit for a photo and find later on that your dead relative really is watching over you. One of my favorite types of magic acts is The Quick Change act. The magician and/or assistant come on stage, dance around a bit, and through a series of rapid fire progressions completely change outfits. Although interestingly enough the first time I ever saw a Quick Change it wasn’t being done by magicians but rather a marching band! The color guard erected a large cloth tunnel on the field and the marching band went through in a single file line. The tunnel was maybe ten feet in length over all but literally as each member of the band marched through from one end to the next their uniform colors completely changed and the music never missed a note. It was quite cool. Later on I started seeing quick change being used as a kind of “kicker” note in various acts. Most notably in my experience was Jonathan and Charolette Pendragon doing the Houdini Substitution Trunk. Jonathan gets into a bag inside a large trunk which gets closed and locked. Charolette wearing a black spandex outfit stands on top of the trunk, raises a curtain and in less than a second the curtain drops to show Jonathan standing on top of the trunk. He opens it up, opens the bag and Charolette pops out wearing a white spandex outfit. A change of places and a change of outfits. Very cool. Later on I began seeing actual Quick Change acts where the overwhelming number of changes is the whole point of the show. I’d sort of figured out how I thought a single quick change could be done, but as soon as I started seeing these full on quick change shows I was pretty surprised and my little theory was blown out of the water. Not long ago I did finally lay my hands on the right information so now I know how it’s done. Would I ever do it? I don’t know. It’s fun to watch and I appreciate it for what it is, but I don’t think I would do an act like that though I might consider doing a singular quick change as part of something more appropriate to me. What I am finding out is that there is some tiny historical evidence to suggest that quick change may in fact reach just barely into the period of history the SCA covers, though not the culture. There is a suggestion of quick change having some origin in Kabuki theater in the very late 1500’s to very early 1600’s. Kabuki is said to have begun in 1603 according to the history I have so far, but I’m willing to give a couple of years grace period for development (and let’s face it, wishful thinking). Did its origin include quick change? I do not know that yet but again, wishful thinking. I am not a proponent of Far Eastern culture in the SCA generally speaking, but I’m finding more and more that a lot of the entertainments that I am interested in presenting for my medieval carnival do have some origins in ancient Chinese acrobatic theater. So my historical wanderings include these things for completeness sake as I continue to develop the ideas. Watch the videos below. The first is a couple of German quick change artists who have achieved a significant amount recognition for the quality of their act. The second is a Chinese magician who has been doing his act for his whole life and is using historical techniques (not as far back as I’d like) as his basis and extending them himself. And then imagine how cool it might be to quick change between your two favorite SCA costumes at 12th Night. Yeah, that’s a cool trick. No, not me. I wish. Bubble Magic with Tom Noddy! Tom Noddy making a bubble dodecahedron. About a year ago now I met one of the coolest people I know; Tom Noddy. I had the good fortune to be on the same stage with him and being the easy going and friendly guy that he is it was extremely easy to walk up, introduce myself and find myself becoming friends with him almost instantly. Tom does “Bubble Magic.” What’s that? Tom plays with bubbles professionally. You know, that sudsy soapy stuff that comes in a little container with a cheap plastic “wand” the you give to your kids and the run around spilling it everywhere while they blow bubbles at the family dog. But how do you build a professional career out of doing that? Well, in Tom’s case you decide you don’t want to live the life of a corporate or factory drone, get yourself organized and prepared to spend some time living on the road because you want to see the world, and in order to save enough money to make it doable you find ways to entertain yourself at home while you finish out your last year or so of punching a clock. And cheap and easy ways to entertain yourself at home include spending all your time playing with toys like yo-yo’s and paddle ball and…. bubbles! Yesterday I spent the day with several friend and we learned “Bubble Magic” from Tom. Tom pointed out a lot of amazing things both artistically and scientifically about bubbles and just how cool they really are. For example did you know that the reason why you see all those colors on the surface of a bubble is because the film is actually thinner then wavelengths of light? The different colors show you the different thicknesses of the film so they colors act as a sort of topographical map of the bubble itself. One of our members was already spinning ideas of how to create her own bubble act and that is a good thing! So, who is Tom Noddy? He’s a man of great talents, wonderful patience and a good friend. Most people probably didn’t really know this actor. I really first encountered him as Commander Jeffery Sinclair on Babylon 5. Even though he was only on the show for the first season (and a couple of episodes after that), he was a wonderful character. He really had the sort of Warrior Philosopher thing going in the character he created, an archetype that appeals to me on a lot of levels. One of the things that appealed to me in the whole of Babylon 5 was it’s forward looking ideas. One such idea was expressed beautifully in this clip.